The royal palm is one of the most instantly recognizable, and arguably one of the most beautiful, palms around the world. It is native to Central and South America, as well has having a "hyper-diversity" of species in the Caribbean Islands. 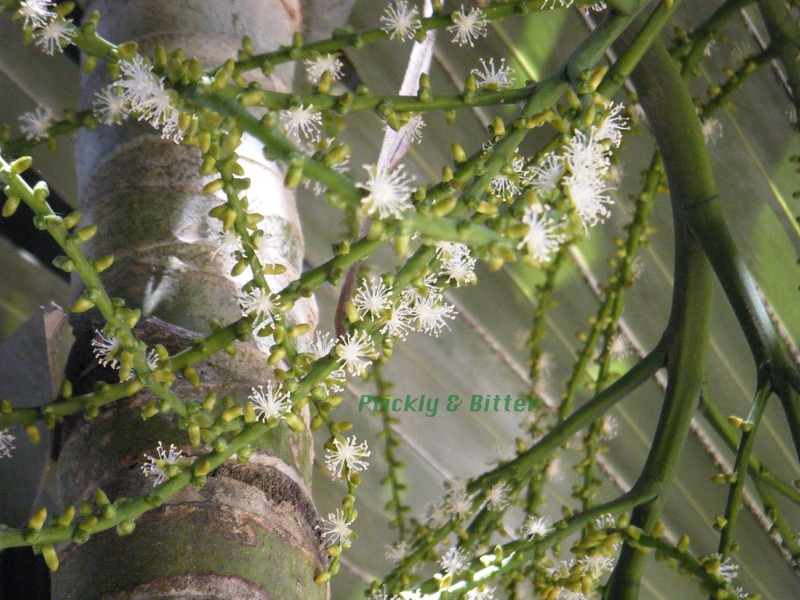 In countries where it is native, there is usually only one species native to each country with the exception of Jamaica which has two native species of Roystonea, and Cuba which has five native species. 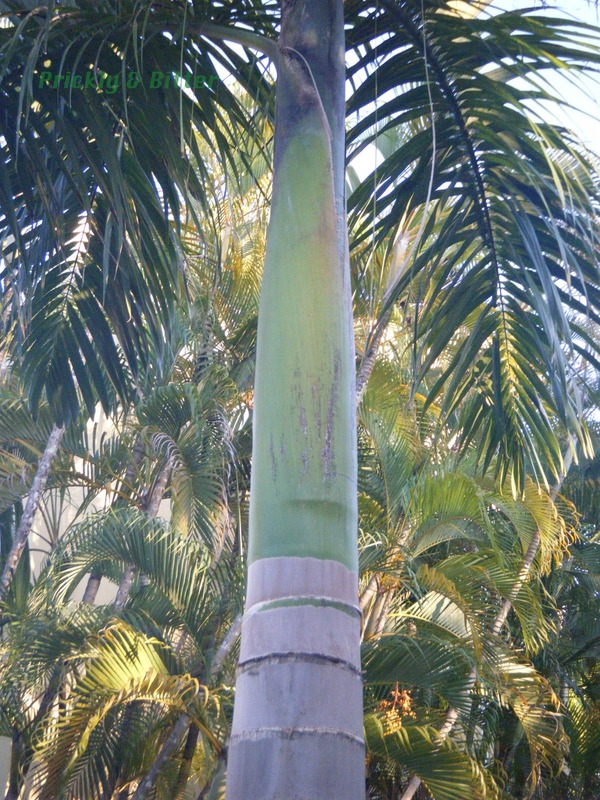 The tree is recognized by its green leaf sheathes which encircle the tree at the top and its concrete-like stem (much more pronounced as the tree matures and loses the leaf sheath scars). As the leaves mature, they are easily sheared off by the wind. They are also easily cut off from the tree and used as roofing material for thatched roof houses or huts. There are approximately 20 species in the genus, and other than extreme examples like R. violacea with its purple stem, they are almost impossible to distinguish unless you pay close attention to flower morphology. 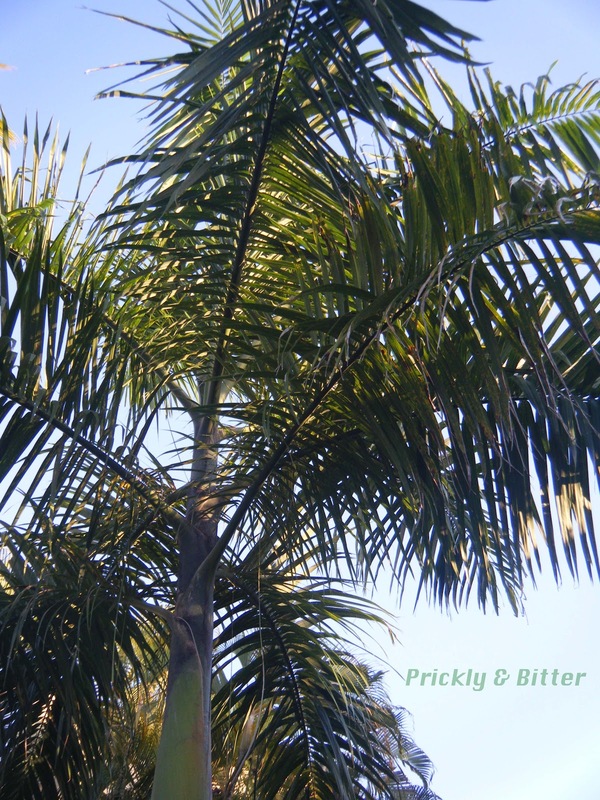 The royal palm has many uses throughout the Caribbean and Central/South America, not the least of which is as a coffee substitute. The seeds to not contain the caffeine that is naturally present in coffee beans, but it does have a very similar flavour when roasted. It makes me wonder why it is not used more often as decaf coffee! The men that pick the ripened fruit of the royal palm have special training starting from when they are very young (and much more fearless than the average adult male) to teach them how to properly climb the trees. By the time they are in early adulthood, they are able to climb a 20 meter tall royal palm very quickly with bare feet and only a rope for assistance. A machete is used to cut the stalk that all of the fruit is attached to (very similar to a bunch of grapes), and the fruit bundle is carefully lowered to the ground with the assistance of a second rope. 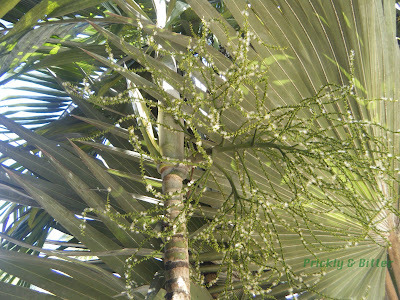 The wood-like material of the stem of the royal palm is used as a building material, and the "heart" of the palm (when the plant has only started producing its first few leaves, the plant is cut at the soil surface and carefully peeled apart to reveal the young, tender area responsible for the upward growth and the production of new leaves. 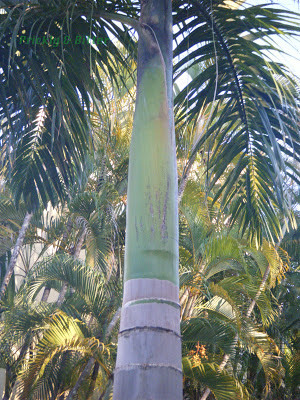 This is called the palm "heart") is used as a source of food. The hearts of palm we buy in North America in cans in the grocery store is highly unlikely to be from the royal palm; it is more likely to be from the coconut palm or the jucara (also called the palmito, Euterpe edulis). 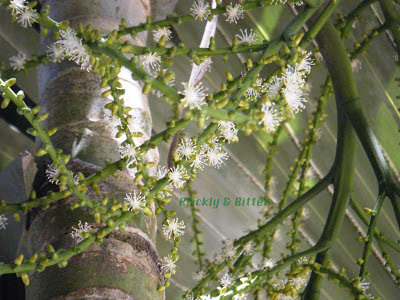 The tree also serves a huge cultural significance in Cuba; it is their national tree. It is said that for every citizen of Cuba there are at least three royal palm trees! 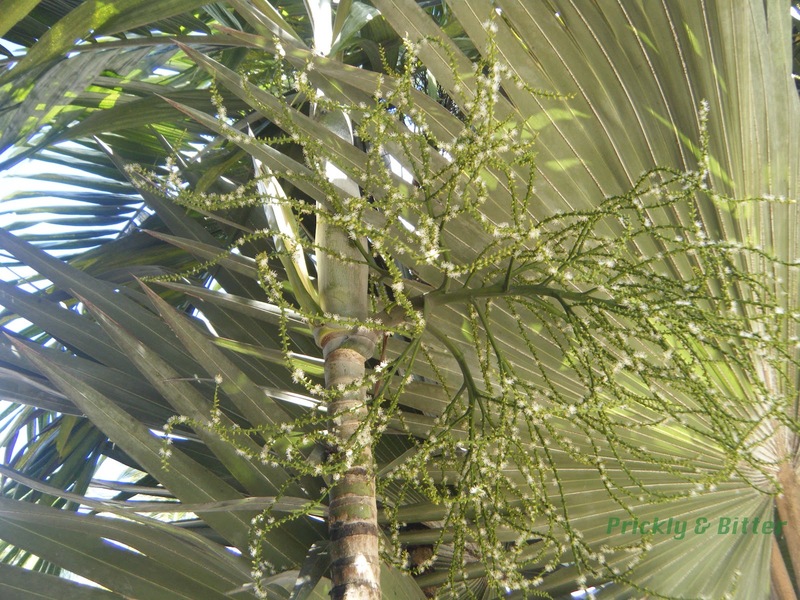 The royal palm is also very important as an ornamental species in the Caribbean, and not just because of its beauty. The tree also has a hidden secret that you wouldn't know until it was pointed out to you: it is a natural lightning rod. The new leaves are produced from the middle of the bundle of leaves and sticks straight up towards the sky until it starts unfurling. 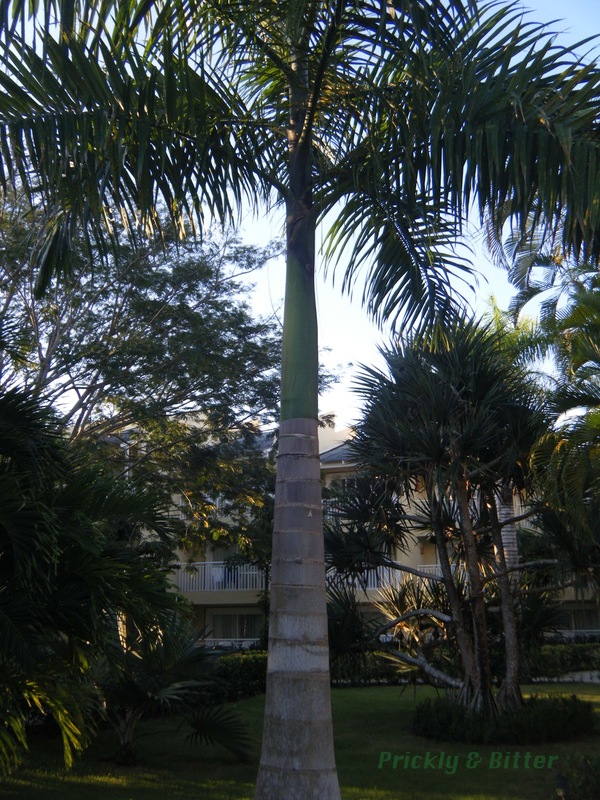 This single palm frond can make the tree significantly taller than a lot of hotel buildings, and almost twice the height of the average beach hut. When you walk around hotel grounds in tropical countries, look for trees that are very tall but have no leaves on top. Those have almost certainly been struck by lightning and lost all of its leaves, but leaving the very tough stem still standing. Labels: coffee, common, Dominican Republic, edible plant, flowers, monocot, national tree, non-native species, Palm tree, royal palm, Roystonea sp.